Information: A very versatile test instrument that is designed to precisely evaluate and trace the working, setting and hardening times of various types of dental materials such as dental filling composite materials, dental cements, dual cure dental bonding agents, elastomeric impression materials and denture based resin materials at laboratory room, set and oral simulated controlled temperatures. According to the American Dental Association's laboratory research study presentations at the IADR March 1982 meeting in New Orleans. 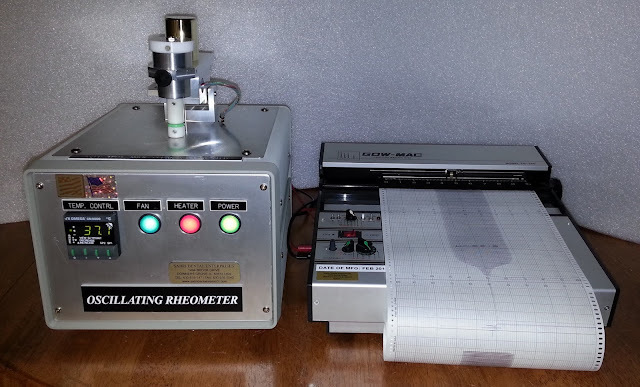 A known amount of testing material is placed preheated or at room temperatures, set test anvil/platens, while the instrument records the materials trace patterns of working and full hardening times in a straight line or in wide oscillatory patterns on the attached strip chart recorded for an easier determination of test results of material setting times with a high degree of accuracy shown in time minutes and seconds.